What frequency will you send your electronic newsletter? How will you make it relevant? Electronic Newsletters; What’s the IF? So much can be said using electronic newsletters. Start with the value you can provide to your customer. Daily eBlasts. Monthly member news. Weekly tips and tricks. Electronic Newsletters go by a lot of different names. Whatever you call them, they are—or should be—an integral part of your Digital Marketing Plan… right? We’re all told as much, but is this really still true? 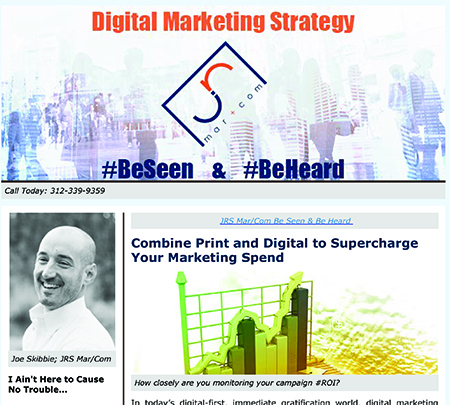 We have more options for delivering marketing communications than ever before, but the electronic newsletter still offers many advantages, especially when used in conjunction with other outreach methods. Compared to anything in print—Newsletters, Direct Mailers, and Media Ads—the benefits of digital distribution are clear. Electronic newsletters are a measurable form of Digital Marketing with complete reporting. Properly tracked, reporting can include information on the number of newsletter Sends, how many were Opened, what Links were followed, the Devices used, and more. Sales professionals can follow up directly with those who click on content and target their message accordingly. If social media sharing is important to you, you can track who distributes your e-newsletter across Twitter and Facebook, as well. So, the answer to the question is yes, electronic newsletters are still important… IF. But what’s the IF? That answer is simple, too: IF stands for Interval and Function. Publishing on a regular schedule gives readers the expectation of value delivered on a reliable timetable. Having a forum, not only to regularly remind your existing and prospective clients of the products and services you offer, but also to educate and generate demand, is the reason to diligently manage your contact list and establish a predictable cadence for outreach. Sending newsletters irregularly reflects directly on your company’s reliability—it’s as simple as that. Whether it’s a daily, weekly, biweekly, semimonthly, monthly, or quarterly mailing, decide on the frequency that makes sense for your business, and stick to it! If you are struggling with what to write about, enlist a professional writer from JRS Mar/Com to take the stress out of the project. If you have multiple ways to distribute content, pay careful attention to which methods are working best. It’s important to consider industry standards for the best times of day to email your newsletter, tweet, or post to Facebook, LinkedIn, Instagram, Snapchat, etc. However, it’s also important to experiment and see what your specific audience prefers. Track everything and discover the methods that work best for you. A newsletter should be more than a just a promotional tool. It can be used to qualify sales leads, generate website traffic, and engage clients. Are you writing to an internal or external audience? How engaged is your audience—are they prospects or clients? What is the diversity of your audience—are you trying to make your newsletter do too much? No matter what you intend to do with your newsletter, what you send to them must be valuable. The age-old question, “What’s in it for me?” must be asked and answered. One place to verify the value of your electronic newsletter content is on your website. Start tracking the baseline metrics of your website traffic if you’re not already. If you know what your typical daily traffic looks like, you’ll have a better understanding of your electronic newsletter’s ability to drive increased traffic to your site. Promotional Tool – If your primary purpose is to generate awareness of a new service, product, or event, your newsletter needs to be full of visual interest. Without mimicking a sales flyer outright, there should be plenty of color, bold graphics, and photography. Limit the copy to teaser text but include links to your website or registration program so that people who want more information can get it on their terms. Traffic Generator – When your objective is to drive eyeballs to your website, options are key. Think of the real estate in your newsletter as the front page of a newspaper or the cover of a magazine. Include plenty of headlines and just enough copy to entice further interest. Stay focused on variety in a traffic-generating newsletter—include as many stories about your company culture as you do about successful projects, new products, or upcoming events. Try to generate recurring features so that readers can stay up to speed on your company’s stories as they unfold. Sales Qualification Tool – Using a newsletter in this manner is what experts call “drip marketing” or “nurture marketing”. It is a prescribed, systematic dissemination of information, designed as much to educate a client as it is to convert prospects into customers and clients. When the value of your offering is a complex thing to explain, a sales qualification program can be a great way to clarify your message in a way that’s easier for prospects to decipher and digest. Therefore, this type of campaign works best for marketing services or higher-end, higher ticket-priced consumable goods. It involves offering longer-form content such as case studies, white papers, ebooks, etc. in exchange for information about the prospect’s pain points, allowing sales staff to customize their outreach and response. Client Engagement Device – This is the trickiest of the four types of newsletters to produce, but its outcomes can be the most lucrative if executed properly. If your objective is to generate referrals and empower your current clients to be your brand ambassadors, then a client engagement campaign is the way to go. There are lots of options here to incentivize the generation of leads from your network: prizes, raffles, drawings, vacation vouchers… the list is endless. The offer can’t be too gamified, or else the value your clients think they have to you will be cheapened, but it has to be fun! Experiment with several approaches to find one that works for you. No one’s saying that the electronic newsletter is the one-stop-shop, be-all, end-all for marketing communications, but it is a great way to stay top-of-mind with your clients, prospects, and supporters. When you’re consistently in front of all of these groups, you’re that much more likely to get a phone call and/or referral when a need for your product or service arises. Don’t rely on your electronic newsletter alone. Other key components of a digital marketing plan include a well-designed website, frequently updated blog posts, activity on social media, and search engine optimization based on attainable industry keywords. These are all powerful tools that increase the reach of your marketing efforts when coordinated within a complete digital Marketing Plan. That’s what we do. Contact us to Be Seen & Be Heard with JRS Mar/Com.